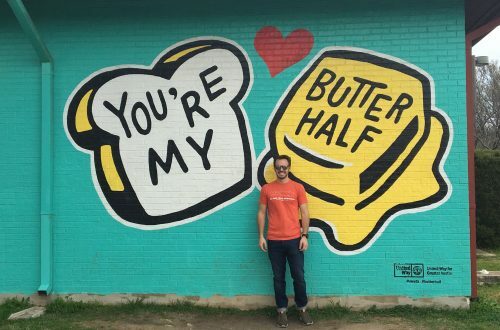 Our Airbnb was located in Capitol Hill, an awesome neighborhood with tons to do that’s well connected to everything. 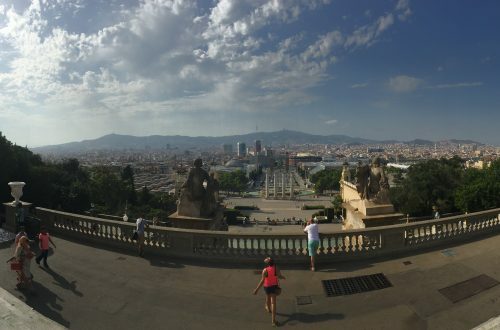 The one negative to our airbnb was that it wasn’t very accessible if you have trouble with stairs because you have to go up or down about 3 flights of stairs just to get to the place itself. Overall, Seattle was much hillier than we expected, so be prepared to walk some hills. 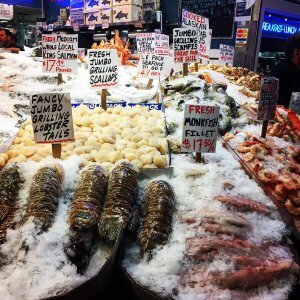 Pike Place Market – The market famous for “flying” fish and copious amount of seafood made our mouths water just walking through it. There was soooo much seafood, including lobster tails the width of Mike’s forearm, scallops the size of baseballs, and enormous crab legs. We didn’t get any of this seafood, but we did get clam chowder at Pike Place Chowder (more of that later). 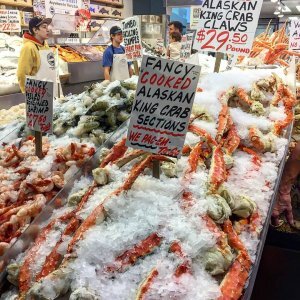 Make sure you at least take a walk through Pike Place Market while visiting Seattle. 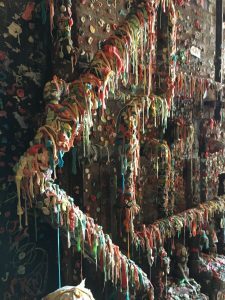 Gum Wall – Right next to/under the Pike Place Market is the famous, instagrammable gum wall in Seattle. 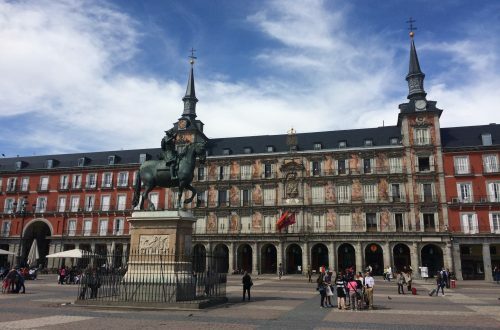 It’s worth the visit since you’ll probably be at the market anyways. 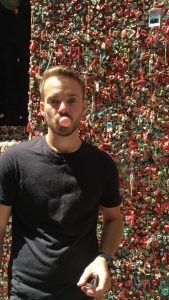 Make sure to bring some gum along so you can add your own piece of gum to the wall. There’s also a newsstand right around the corner where you can buy gum like we did. 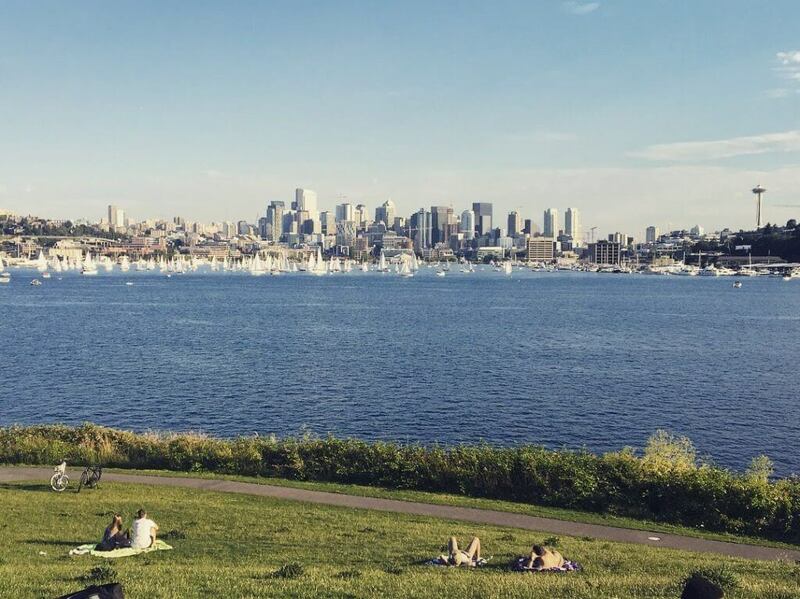 Gasworks Park – Gasworks Park in Seattle is an awesome urban park on the north side of Lake Union. There’s an amazing view of downtown Seattle from the park. We highly recommend visiting. Make sure to bring some food and drinks to watch the sunset. We brought some beers from San Juan Island Brewery and some poke from 45th Stop N Shop & Poke Bar (more on this later). It was a nice, relaxing evening with beautiful scenery during our visit to Seattle. Dispensaries – Washington is one of the states that have legalized marijuana. There are quite a few dispensaries located throughout Seattle, so if you want to participate in the local delicacy that is marijuana, there’s opportunity to do so. Note that there aren’t as many dispensaries in Seattle as there are in Denver, so you may have to walk a bit to get to one. 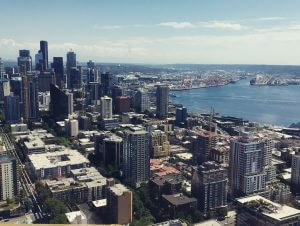 Space Needle – Arguably the most iconic building in Seattle, the Space Needle, is a must-see while in town. 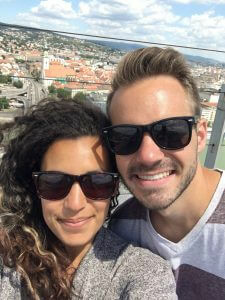 It is a little expensive to go up the Space Needle, about $35 depending on the time of year. However, you can buy a pass to see 3 different attractions in Seattle for $69. We bought the 3 attraction pass for $69 which granted us access to the Space Needle, Chihuly Glass Garden, and the Woodland Park Zoo. It’s essentially a buy two, get one free with the pass. 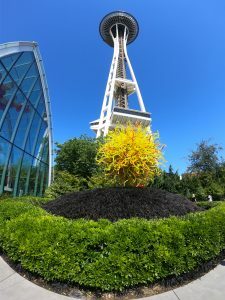 It was worth it to us because we wanted to see the Space Needle and Chihuly Glass Garden. 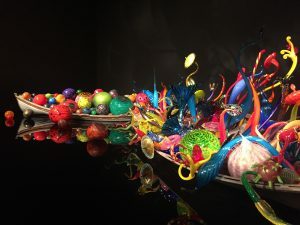 Chihuly Glass Garden – This is a super awesome art museum that features the work of Dale Chihuly, a famous glass sculptor. His work is incredible and truly unique. Chihuly’s talent and skill is outstanding. We were in awe of each and every room and art piece in the Glass Garden. Chinatown-International District – Take a walk through the Chinatown-International District in Seattle. It’s really close to downtown, Pioneer Square, and both the football and baseball stadiums. We didn’t eat there, but it looked like there were plenty of great options. Alki Beach – Even though Seattle is located on a sound and not the ocean, we were still itching to get to a beach. Wisconsin doesn’t offer many opportunities to go to the beach… Alki Beach is really close to Seattle and offers an easy escape from the city. Don’t expect a great beach, but it’s better than what Wisconsin offers. There are a bunch of really cool bars and restaurants around Alki. It’s worth a visit if you’re looking for a different side of Seattle. Barrio – When we first got into Seattle it was about 5:00 PM, and we were STARVING. We looked up the best happy hour places in Capitol Hill and found Barrio. 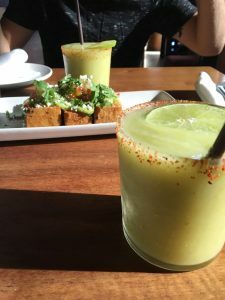 Luckily, we made it just in time for happy hour (right before 6 pm), so we were able to get a delicious avocado margarita and masa cakes. It’s a little on the pricier side, so their happy hour was a good option. Definitely order the masa cakes! Caffe Torino – Originally we just stopped here so Mike could grab a coffee and Becca could use the bathroom, but we are including it in this section because their Honey Lavender Latte was incredible. It was on the daily special menu, but if you are able to try it we highly recommend it! Pike Place Chowder – As mentioned above, this was the place we went to when visiting the Pike Place Market. It opens at 11:00 AM daily, but we suggest getting there early. We arrived around 10:30 and still waited about an hour to place our order. However, this wait is definitely worth it! This is probably one of the best chowders we’ve ever had (sorry, not sorry Boston). 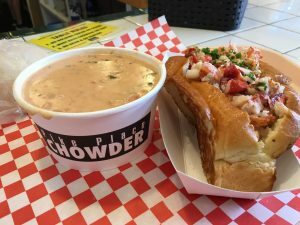 If you like seafood and have some time to wait in line, go to Pike Place Chowder! It’s the place to eat while visiting Seattle. 45th Stop and Shop & Poké Bar – This may come off as a little odd because 45th Stop and Shop & Poké Bar sounds and looks like a corner store/gas station. We wouldn’t have checked this out on our own, but our friend who lives in Seattle recommended it. As we stated earlier, we came here to pick up some food to bring to Gasworks Park. The poké here was surprisingly delicious. 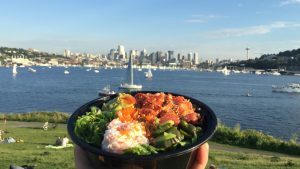 If you like poké and are going to Gasworks Park or are simply in the area, you have to get poké from this unassuming little, neighborhood spot! Wandering Goose – We ate here for breakfast and got the biscuits and gravy with mushroom gravy and the veggie plate with pimento mac’ cheese, sea island peas, collard greens, and a buttermilk biscuit. Everything was great, and while we didn’t get it, the fried chicken breakfast options made our mouths water (yes, we looked at the food everyone else ordered). Sunfish – While enjoying the beach in Alki, we were looking for a seafood place nearby. We came across Sunfish which is right by Alki Beach. 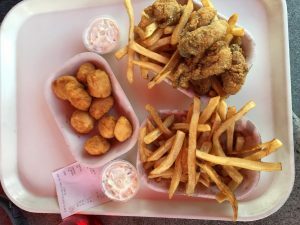 The fried scallops and fried oysters were exquisite. It is one of the cheaper options in Alki but still a great place to check out. West Seattle Brewing Company – This is just down the street from Sunfish right on the main drag in Alki. West Seattle Brewing company gives you a San Diego-ish vibe with the lawn chairs and sand area that you can people watch those at Alki Beach. The beers we tried were pretty good and reasonably priced, especially during happy hour (clearly happy hour was a theme to help save money while in Seattle). Frankie and Jo’s – If you’re looking for dessert, head over to Frankie and Jo’s. 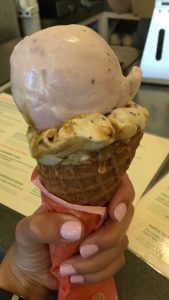 They’re known for their plant-based ice cream, and it’s absolutely delicious. 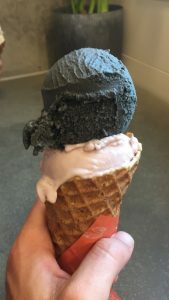 We tried the Salty Caramel Ash (with activated charcoal! ), and two other flavors on the seasonal menu (Harvey Strawberry Milk and Almond Butter Kale Caramel). All the flavors were so good, and we would definitely return to try their other flavors or just eat another waffle cone next time we’re visiting Seattle. We might have even gone back if we had been in Seattle another night. 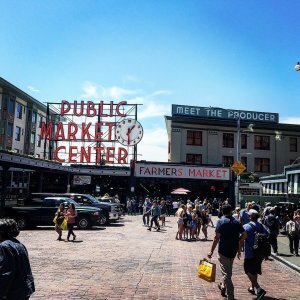 Are there any other recommendations you have for people visiting Seattle? Is there anything we missed out on when we visited?